When the draw was announced for the group stage of the Champions League I will admit I was a little worried. And this was before I watched us slump into a lethargy on the field domestically as the season drew close enough to embrace. For Man City with their billions bankrolling a fine selection of superstars, when fit and firing on all cylinders, are a very serious force to be reckoned with. 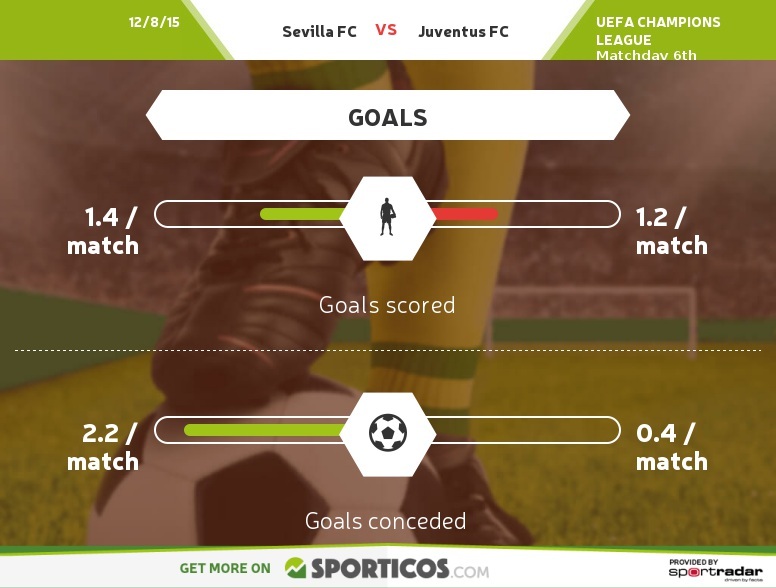 Add to the mix Seville, who are canny operators on the European stage and a plucky Monchengladbach side and progression appeared far from a given. However, as we approach our final fixture of the group stage, the only fight left is not for qualification, but to head through in 1st, thus avoiding the other group winners such as Bayern, Real and Barca. Arguably, our best form up until recently has come in Europe. Perhaps I am paying Allegri too much credit, but the results and current state of play speak for themselves. With the loss of three world class, seasoned professionals and the intake of new, talented recruits we then found ourselves suffering our worst injury crisis for many moons. With forced changes and newcomers our only option, Allegri decided to prioritise the Champions League, whilst perhaps hedging his bets in the league. Believing that once key players returned from injury, league form would settle and we would climb the table before it was too late to mount a serious defence of our title. Some continue to criticise the coach, but presently, his bets are paying off. Regardless of Man City’s efforts at home to the Germans, due to our head to head record against the boys in blue, a draw in Spain will be enough to retain pole position of the group. Which will be a solid achievement, especially so given our struggles. Our form of late has been greatly improved. Five wins on the bounce. Points gained on the leading pack domestically. Key players finding their rhythm and more returning to the ranks. The defence has regained its solidity, the Dybala/Mandzukic tandem is working. Lichsteiner has returned from heart surgery every bit the locomotive of a player we all adore. Plenty of reasons to be cheerful. 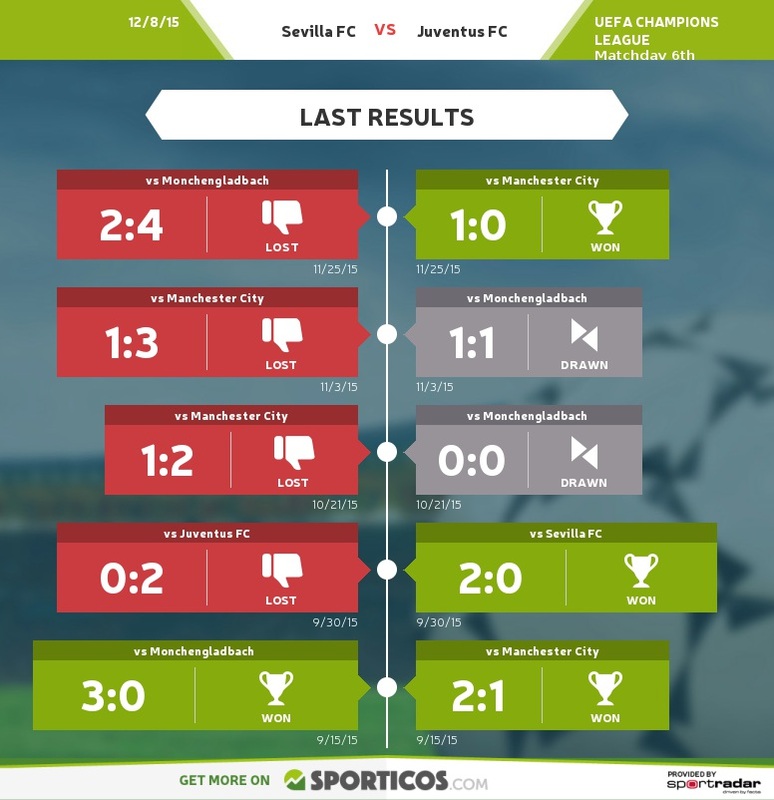 Whilst placed presently bottom of the table, Seville can still qualify for the Europa league with a victory coupled with the expected Monchengladbach defeat in Manchester. Their pedigree in that competition is brilliant, having won the cup in both the last two seasons. Widely respected coach Unai Emery has been experiencing mixed form domestically, with his side presently sitting in a disappointing 10th spot of La Liga. Their latest result was a 1-1 draw away to La Coruna. We will have to be careful with Banega and Gameiro. For the two can combine well through the middle, yet we should be capable of dealing with the threat from wide positions, given our height in the box and power on the flanks. Which doesn’t take into account the TV money. Too much work on the calculations are required to glean an approximate figure for the market pool TV funds earned thus far. Yet for comparison, last season’s path to the final brought us close to EU60m from the market pool. Its plain to see why champions league qualification is essential for the club’s ambitions. It seems that plenty of supporters have rather short memories. For the return to the 3-5-2 has brought not only an upturn in our fortunes but also yet more wailing of ‘players demanded the change‘ and ‘Allegri has tinkered too much‘. Which seems at best odd, for Allegri began the season deploying the same 3-5-2 we now see as the answer to our hopefully fast vanishing woes. Present reports suggest we will go with a 3-5-2. 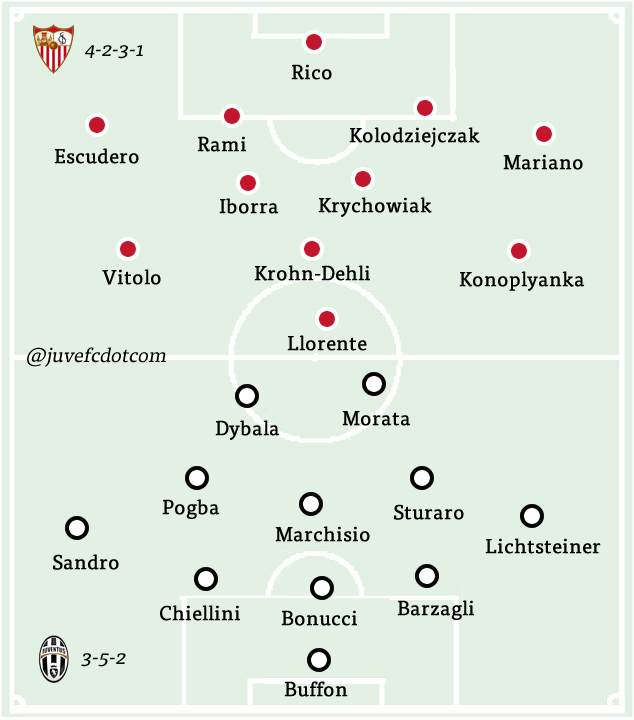 There are some doubts over Mandzukic, which could allow Morata his first start for a while. 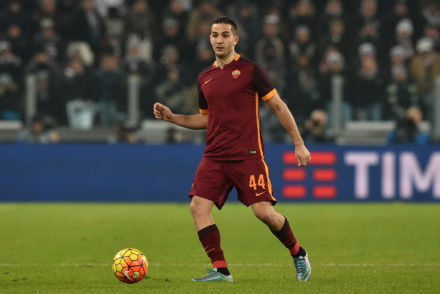 Great chance to stake his claim for a place in the starting XI. Khedira and Pererya continue their comebacks on the training field though are out of contention for this match. Asamoah was not selected for our group stage squad due to injury, neither was – much to the rageful chagrin of his die hard supporters – Padoin. We can afford to set out to soak up pressure and hit the spaniards on the break. Which is different from playing for a draw. 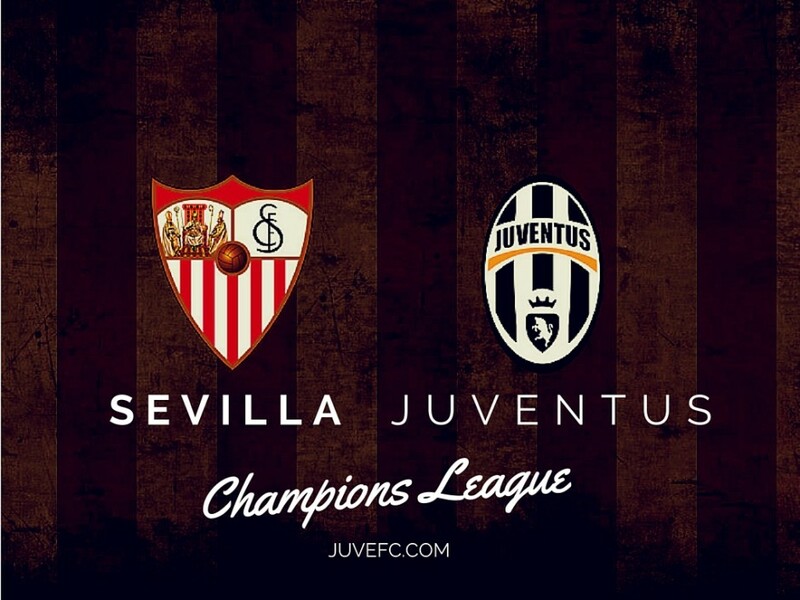 It is Seville who have to win to continue their european adventure in the Europa League. And as the home side, in front of their own fans, they will have far more pressure on their shoulders to perform. For us, it is a chance to continue decent form in Europe, add pace to the momentum and see how our newfound confidence in Serie A translates to the continental stage where we have raised our game and played well in all but the matches against the Germans. 3-5-2: Buffon; Barzagli, Bonucci, Chiellini; Lichtsteiner, Sturaro, Marchisio, Pogba, Alex Sandro; Dybala, Morata. 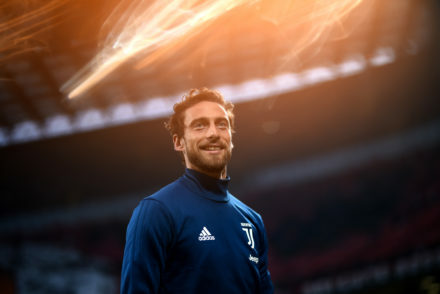 Claudio Marchisio – LCD – Leader. Champion. Decisive.